Jobu introduces you to Uruguayan midfielder, Diego Pérez. Another day, another great Uruguayan for you to meet! In theory, I could write 3.5 million of these, so if you don’t like it, just be happy I’m keeping it to prominent sports figures (you probably don’t want to meet Pito el Carnicero or Martín el Tio Bago and the like). Today’s Uruguayan is Diego “El Ruso”** Pérez. You know I’m gonna like a guy if his nickname is “The Russian,” right? I mean come on. El Ruso is, in fact, not a real Russian. He wasn’t born there. He didn’t live there as a child. 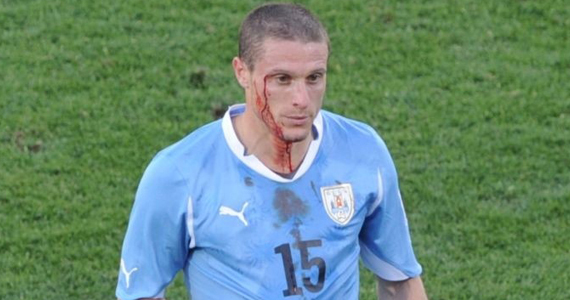 Like Arévalo Ríos, who I profiled earlier this week, Pérez is part of the rough and tough Uruguayan midfield. Both of these guys really made names for themselves with their play in the 2010 World Cup, although Pérez is definitely the more careless of the two. I wouldn’t go as far as calling him dirty. He mostly just gets a little too excited sometimes and his legs and body get away from him a little bit. I mean who hasn’t been there, right? Anyway, Diego began his career on Uruguay’s Defensor Sporting, where he played from 1999-2003, earning a spot on the starting squad and playing 125 games (11 goals) and earning himself a transfer to Peñarol, a powerhouse of the Priméra División of Uruguay (also, as I mentioned in the Ríos article, my least favorite team). After scoring two goals in thirteen games for the Black and Yellow (black and yellow, black and yellow, black and yellow), he was transferred that same season to Monaco of the French Ligue 1, where he spent the next six years of his career, playing 146 games in the defensive midfield, and even notching a couple of goals. After his coming out party in the 2010 World Cup, he caught the eye of the Italian Serie A team, Bologna, who signed him for £2.1 million. It was definitely a proud moment for me as a fan, because I had grown to respect Diego a lot because of his hard nosed style in the World Cup. It was great to see him get himself a little pay day and move onto greener pastures. To date, Pérez has played in 55 games in Bologna’s defensive midfield, although he hasn’t yet found the net (probably because he’s a defensive midfielder). El Ruso debuted for the National team in 2001, and has appeared in 74 games for Los Charrúas. His debut came in the 2001 Copa América tournament in a 1-0 win against Brazil, and he has represented Uruguay in the 2004, 2007 and 2011 installments of the tournament as well. He was also part of the 2006 World Cup squad, as well as the aforementioned 2010 World Cup squad. Like the rest of the team, he has enjoyed his greatest successes in the last couple of years, helping Uruguay to their fourth place finish in the 2010 World Cup and to their 2011 Copa América championship. His first career international goal came against Argentína in the quarter-finals (hee hee! lo siento, Argentínos! ), although he was also red carded in that game (that’s so Ruso!). He has started every game during the qualifying period for the 2014 World Cup as well, helping Uruguay to second place so far in the standings (Chile is ahead, but also has a game in hand at this point). At 32 years of age, he’s most likely facing his final big time international tournaments (with the 2011 Copa and the 2014 World Cup), so I’m hopeful he can keep up the feverish pace with which he has helped command midfield for Uruguay. If not, he could always help provide a second half spark in the midfield, or start and give way to a younger player when he tires. His spirite must be on the team in some form or another. I can’t wait to see where “El Ruso” can help Los Charrúas get to in 2014. ** Note: His nickname, according to some research done by the good people at lacelesteblog.com, came from his mother. Apparently, she saw him running around playing fútbol as a kid and his face would get really really red. She said he looked russian. The rest, as they say is history.